1 Blemished Available: $629.10 This item is available as a Blem/Refurb. These are items that cannot be sold as "New" merchandise and are limited to stock on hand. See the product details for a description of the product's condition. 2 Blemished Available: From $559.20 This item is available as a Blem/Refurb. These are items that cannot be sold as "New" merchandise and are limited to stock on hand. See the product details for a description of the product's condition. 1 Blemished Available: $559.20 This item is available as a Blem/Refurb. These are items that cannot be sold as "New" merchandise and are limited to stock on hand. See the product details for a description of the product's condition. 1 Blemished Available: $419.40 This item is available as a Blem/Refurb. These are items that cannot be sold as "New" merchandise and are limited to stock on hand. See the product details for a description of the product's condition. 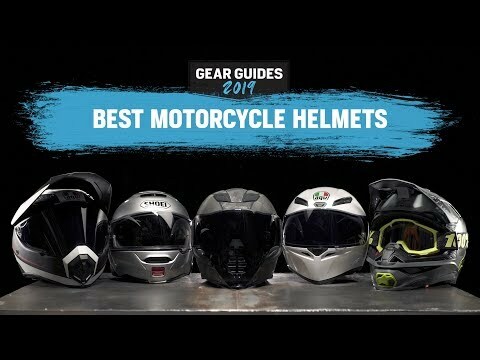 Quality helmet that fits great and looks good. Would buy another one. Great helmet. Price reflects the quality. This is the best helmet I’ve ever owned. Fit and finish are very good. The specific Sena communication/Bluetooth system is an attractive add on. Being a long time Shoei customer I had no doubt that ordering this helmet online would result in a perfect fit like every other medium-sized Shoei product I've owned. Unfortunately that wasn't to be the case this time around. RF1000, 2-Hornet DS's, and Neotec (original) all fit ideally, but apparently there's been a significant change as I can only wear this helmet for about minute before my head starts throbbing and my temples ache. Holding the helmet is a different story altogether... It's exceptionally well constructed and featured. Also purchased the Sena SRL comm unit for it. Contacted Shoei via email and haven't even received a reply. 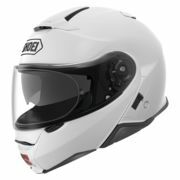 Don't really know where this leaves me as Shoei has been my go-to lid for the past decade, and the original Neotec served ideally for 7 years. Time to find a helmet store. Shoei changed... My head didn't. I like everything about this helmet with one exception. 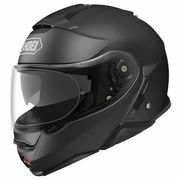 The fact that Shoei and Sena work together to make this helmet accept the Sena Bluetooth unit perfectly but any other Bluetooth unit looks like a total add on and can be difficult or impossible to install. Preordered Mar. 2018 and got it in April. A couple of weeks later went on a 2000 mile trip. Helmet is very nicely made and really like the looks. The only complaint I had was after a few hours started really hurting just forward of my ears because it was so snug. Opening the chin bar really helped but due to the cold temps that was not a option. Thought that it would loosen up as it broke in but it never did. On returning home I ordered the thinner cheek pads and that took care of the problem. As for air flow with my windshield down low I got plenty of ventilation from the top and chin vents, but did notice if I raised the shield on the helmet it blocked the air entering the top vent. With the shield down I could actually feel the air on the top of my head which was a first for me with a modular helmet. On the return trip we rode in some really hard rain ( I mean it would drown a frog).With the shield down and vents closed my head stayed completely dry and the Pin Lock worked like a dream, no fogging at all. This is the first high dollar helmet I’ve purchased and over all I am very pleased with it. Thinking of buying one for my wife also now. Now if Sena will put the 30k guts in the SLR I’ll get that and hang up my 20S’s. I was in heaven with my old Shuberth C3-Pro but wore it out. Then the C4 came out and I couldn't believe what a step back it was. 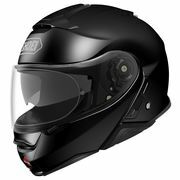 I have had great experience with the Shoei RF-1200 --arguably the best all-around non-modular helmet-- but I was not in love with the Neotech (Shoei's prior modular offering). 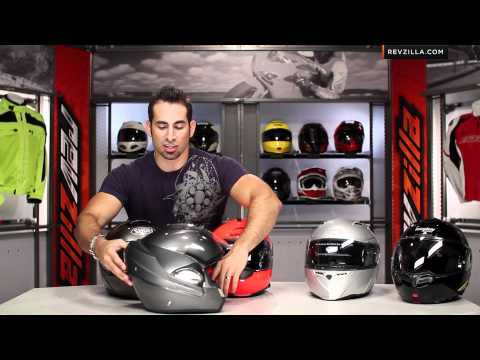 But alas, Shoei comes out with the Neotech 2 and I'll give it a shot. This is a very solid and no-nonsense helmet that will not disappoint. In my mind Shoei hit a triple on this one --maybe no a home run because there are a few nits but nothing that will cause you regret in your purchase. The integrated comm system is very good. The speakers and microphone install easily and work well. I can hear music and phone calls well. Because there is a lot of room front to back in this helmet, the boom microphone on the front has plenty of room and doesn't get smashed against your lips. There are a few minor gotchas in my mind, but you can live with them. 1. It's a tad heavier than I would ideally like to see, and the shell is a bit larger than ideal for size M. I can however barely fit it into the hard side luggage of a BMW bike. 2. 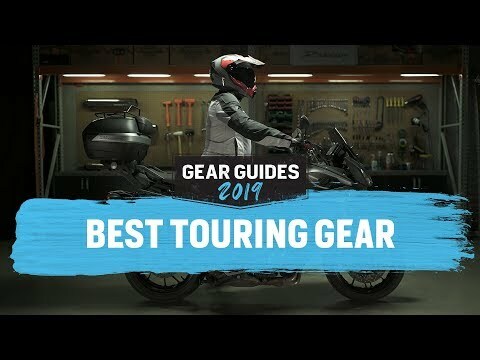 There is no removable battery to swap in on a longer road trip, or recharge separately-- you have to take the entire helmet to an outlet and plug it in. 3. It's entirely subjective, but I think the style of the shell is a tad bit basic / plain. But that suits the theme of this helmet in my mind: very solid choice, nothing wrong, nothing especially delightful...just regular. 4. They went with Sena instead of Cardo so a couple of times, I'm riding along listening to music and somehow the voice activated app thinks that the song lyrics are telling it to call someone in my contacts list. So imagine the embarrassment when I have to say, uh, sorry, my helmet dialed you accidentally. I may have to disable the VOX (voice command). I actually had to return the helmet as it was too small for me. I ordered as per their size guide and although I was at the lower range of the size chart it was still too small for my melon. Great helmet, I haven’t had other modular helmets to compare it to. But it is a usual high quality helmet you would expect from Shoei. I recommend if you are I. The market for a modular helmet. Just bought one of these after lots of deliberation and research and to fix some issues I was having with my Shoei Hornet. Didn't buy it here but as the reviews here are super helpful I thought I'd give back to the community. Overall I'm super happy with the Neotech. I take a Medium i the Hornet but had to go to a small for this helmet. Snug, but the right size. I wanted to a helmet to solve a few issues I was having with the Hornet. Fogging, Buffeting, Noise, Warmth, Not wearing sunglasses, and regular stops. Fogging - in winter, with a full face balaclava and visor down, there is no fogging at all. The internal sun visor fogged slightly but that will be because it doesn't have a Pinlock fitted. With the chin air vent open, I don't get cold air on my face, but it's obviously letting air enter. Noise. It's much quieter than my Hornet - much. That being said, I knew I wanted a quiet helmet - and maybe in my mind I was expecting an experience akin to the first time you put on noise cancelling headphones. That being said, here in Italy, using earplugs whilst riding causes any insurance claim to be nullified, so I don't use those anymore. Warmth. The closed design of the neck padding stops air getting in from underneath - this has a massive benefit on keeping you warm and reducing noise. We'll see how that works out in summer, but for winter riding it's made the need for a full face balaclava redundant. Sunglasses. I wear contacts mostly when riding and the internal sun visor means I don't have to mess around with sunglasses. Especially helpful here in northern Italy where a ride in the hills means going in and out of tunnels very frequently. Can't help but wish the visor was slightly darker - but it's crystal clear. Flip-Up Practicality. This is my first flip-up modular helmet and as I use the bike every day, it's a big help to not have to take off the helmet for gas stops, running into stores etc. So far so good.